eBay's Safe Payments Policy got a lot of attention in the press last week when the auction site banned Google's new checkout service. But an incident has at least one seller wondering how closely the list of prohibited services was vetted by eBay. Bob Kerstein, CEO of Scripophily.com, said the past week "has been hell" for his company, which was included in media reports as being banned by eBay. "We're not a payment service," said Kerstein, and feels the media attention has damaged his company's reputation. eBay added Scripophily.com on its list of banned online payment services last week (http://pages.ebay.com/help/policies/accepted-payments-policy.html). One blog published eBay's list of prohibited payment services and said of them, "All of these services have been banned due to being unsafe for eBay buyers, that they are in some way poorly designed or secured and thus aid fraud" (http://digbig.com/4kxef). Major news outlets covered news of eBay's policy updates because of the ban on Google Checkout, widely seen as a competitor to eBay's own PayPal service. Kerstein said, "Our company, Scripophily.com, buys and sells collectible stock and bond certificates and I have no idea why eBay listed our company here. If we sell something on eBay, we accept credit cards over the phone, checks, Paypal and credit cards on our website, that's it." He said he spent a week trying to get a response from someone at eBay. On July 10, he said Sarah Brubaker, calling herself a senior policy representative of eBay, contacted him and told him Scripophily.com was on the list because "one eBay member said they use the Scripophily.com checkout system" in his or her listing, Kerstein said. Brubaker promised to take his company off the list, he said, but it was still up on Tuesday evening. "Why in the world eBay listed us here is beyond me," Kerstein said. "EBay never notified us about any of this." Kerstein's company has been an eBay member since January 1998 and has 4133 feedback points with a 99.9 percent positive feedback rating. Scipophily.com also operates an eBay Store. Feedback from trading partners include such comments as, "Honest description, Sturdy Package, Speedy Delivery" and "Item as described. Smooth transaction. A+++++." Kerstein said he wonders what kind of due diligence eBay performed with the companies on its list of prohibited services. He said, "It certainly looks like they just added other companies to the list so Google wouldn't look like they were being singled out." What's most upsetting to Kerstein, who once sold a stock certificate to eBay CEO Meg Whitman, is that he "didn't even get an apology" from eBay. eBay spokesperson Catherine England explained why the company included Scripophily.com on the prohibited list in an email statement. "Apparently a few sellers had listed Scripophily as a payment method in listings in the past so they were initially included on the list of prohibited payment methods in an effort to provide as much clarity as possible for the community. "However, since Scripophily itself makes no attempt to be a payment service, we've determined that it wasn't appropriate for them to be listed as one and they will be removed from the list - since the change is global it may take a few days for it to go live to the site but they should be removed within the week." When asked what kind of vetting eBay does before adding a service to the policy's accepted or prohibited list, England responded by providing the list of factors included on eBay's policy, adding, "The combination of factors considered for any one payment service may vary as the range of services offered by different payment providers also varies widely." Meanwhile, The Register reports that eBay's rollout of the Safe Payments Policy in the UK on Monday has caused major concern among sellers after the auction site banned Nochex (http://www.theregister.co.uk/2006/07/11/ebay_nochex_fallout/). Sellers discussed the new policy on several threads on the Discussion boards, including this one (http://forums.ebay.co.uk/thread.jspa?threadID=1100012120). 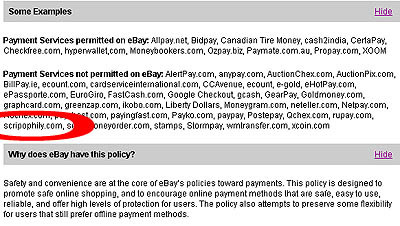 The list of "payment services" prohibited on eBay UK also includes Scripophily.com (http://pages.ebay.co.uk/help/policies/accepted-payments-policy.html).